The coach, the player, the referee. Each role is a little different from one another, however what each person attempts to achieve during their hour in the light is things such as precision, accuracy, confidence, winning. What the Port Authority Silk Touch Performance Pocket Polo gives these people is the right tools to go out and express themselves into whatever field they choose to attempt success in. This Polo can be used for many different reasons, it’s the ideal polo to be worn for any sporting event because of its material that is so light, and comfortable, allowing you to perform at your peak level, without any interruptions from an uncomfortable feel on your skin during the course of your activity. With this polo weighing only 3.9 ounces, it allows you to perform at your best as it’s featherweight material made out of 100% cationic polyester with a double knit feature gives you the exact toold you need to perform better than ever. 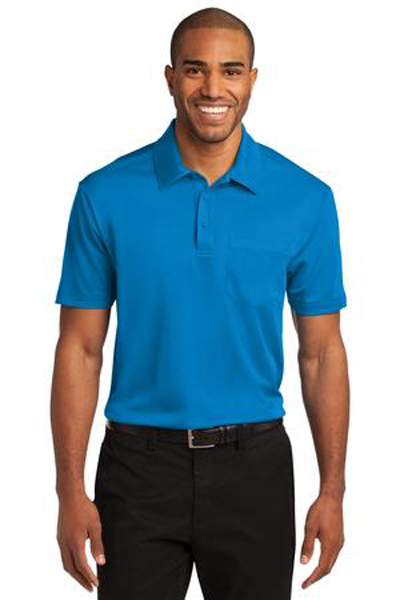 The Port Authority Silk Touch Performance Pocket Polo includes a self-fabric collar to ensure maximum comfort, so you are guaranteed not to have any irritable reactions which will again give you license to enjoy your day in a fluid manner. The tag-free label makes it unique from other polos, where we remove the label to ensure ultimate comfort and performance. From these two features in particular, we believe it gives you the full feel from the silk texture of the polo against your skin. The addition of a pocket to this polo is deal for referees in particular to hold such valuable items such as their yellow and red cards, players on the other hand will be hoping those cards stay in the referees pocket of course! It’s set in, open cuff sleeves ensure that a stressed out coach, lung-bursting player or a regulated referee will have sufficient air circulating around their upper body while completing their tasks. This polo also features double-needle sleeve cuffs and hem. The Port Authority Silk Touch Performance Pocket Polo ranges in adult sizes from XS-4XL, accommodating all body shapes and sizes. This Polo comes in a variety of colours, with enough colours to suit even the most meticulous of individuals. The colours featured for The Port Authority Silk Touch Performance Polo include: Black, Brilliant Blue, Carolina Blue, Lime, Navy, Red, Royal, Steel Grey and White.